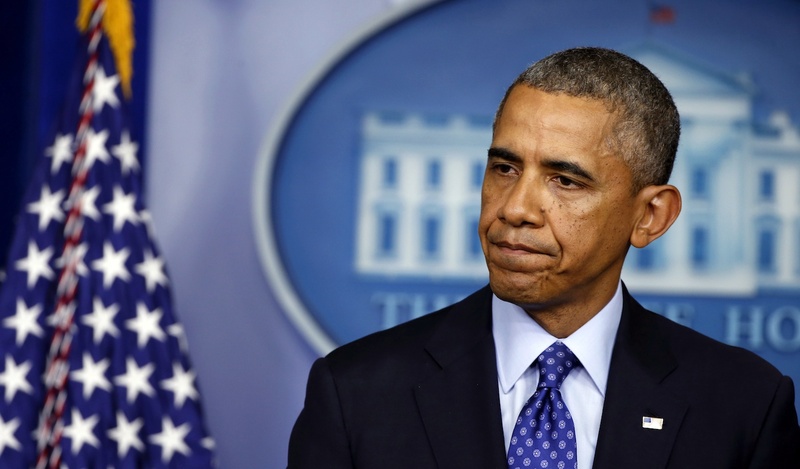 By Authorizing Air Strikes, Did Obama Open the Door for the Iraq Hawks? The president continues a two-decade legacy of wrapping the military option in Iraq in humanitarian packaging. Shortly before seven on Friday morning, US aircraft dropped two 500-pound bombs on artillery controlled by Islamic militants in northern Iraq. Barack Obama, as The New York Times noted, is now the fourth US president in a row to launch military action in that country. Like his predecessors, Obama wrapped the military option in humanitarian packaging. He said on Thursday that the “limited” action he authorized was intended to protect American facilities and personnel in the city of Erbil, the capital of the Kurdish semi-autonomous region, and to prevent “a potential act of genocide.” Kurdish forces retreated suddenly on Thursday from advances by the Islamic State in Iraq and Syria, or ISIS, and thousands of civilians belonging to minority ethnic groups are besieged on a barren mountaintop. Militants have also taken control of Iraq’s largest dam, a rickety structure on the Tigris River that could send catastrophic floodwaters through the city of Mosul and surrounding areas if it is breached. Hawks are already angling to do exactly that. “These actions are far from sufficient to meet the growing threat that ISIS poses,” Republican Senators John McCain and Lindsey Graham said in a joint statement following the president’s announcement that he’d authorized the strikes, along with airdrops of food and water to the civilians trapped on Mount Sinjar. As they have previously, McCain and Graham called for wider strikes against ISIS not only in Iraq but also in Syria. At this point it would be surprising if McCain et al. did not call for escalating a conflict in the Middle East. Still, the quick opportunism of the hawks illustrates the danger of assuming that military action will serve humanitarian ends or that the word “limited” really means anything. By declaring that “we have a mandate to help” in Iraq as well as “the unique capabilities to help avert a massacre,” the president opened a door for the armchair warriors, while putting only vague boundaries around the mission. That the administration is using the word “genocide” is particularly significant, as it carries implications under international law. As John Cassidy points out, defending the civilians on Mount Sinjar and the city of Erbil means that the United States will be fighting ISIS in two areas. Clearly there’s a humanitarian crisis on Mount Sinjar, and the presence of US personnel and a consulate in Erbil gives the administration a defensive rationale for the strikes. But ISIS has been terrorizing northern Iraq for months; the fact that the United States is stepping in only now that the Kurds—”a loyal and reliable American ally,” noted the Times—are threatened by ISIS suggests that the objectives are more complicated. Representative Adam Smith of Washington State, the top Democrat on the House Armed Services Committee, indicated as much. In contrast to the Iraqi government, “the Kurds are worth helping and defending,” he told the Times. If strikes against ISIS are being made on a humanitarian basis, it’s hard to see why they would be limited to the protection of Kurdistan. If—more plausibly—they’re based on other calculations, then the talk of humanitarianism is in keeping with the long tradition of applying a moral gloss to military action. A recent cautionary tale is provided by the campaign in Libya, sold as a last resort to prevent mass violence but which has ended up in chaos. Though the strikes are being described as a sudden and confined response to a dramatic shift in the conflict, the drums for re-engagement in Iraq have been beating for months; the administration may not be stepping in time yet, but it’s been steadily picking up the pace. In June, even as Obama warned of “mission creep,” he nevertheless sent a few hundred troops and military advisers back into the country. It’s clear that the administration—and the American public—doesn’t want to get more deeply involved in the Iraqi crisis, but that’s cold comfort in the face of overwhelming historical evidence that even “limited” military action has undesirable, cascading consequences. Meanwhile, little has been done to heal the political fractures fueling ISIS. “America has been striking Iraq from the air for more than two decades,” The Economist noted. Yes, and for what? Update: California Representative Barbara Lee, one of the House's most outspoken critics of the Iraq war, issued a statement on Friday afternoon saying that while she supports "strictly humanitarian efforts to prevent genocide in Iraq," she "remain[s] concerned about U.S. mission creep in Iraq and escalation into a larger conflict, which I oppose. There is no military solution in Iraq. Any lasting solution must be political and respect the rights of all Iraqis." Lee said that the president should request approval from Congress for any further military action. Representative Jim McGovern, one of the authors of a resolution that passed the House in July banning military involvement in Iraq without legislative approval, echoed Lee's call for congressional authorization. “These strikes do involve the United States directly in hostilities, regardless of how limited they are and regardless of whether there’s a humanitarian purpose involved," he sad in a statement. "If these operations are continuing when Congress returns in September, then Congress needs to take action to authorize them." Connecticut Senator Chris Murphy warned that "the president needs to better explain how this intervention is strictly time and scope limited. The risk is that this intervention draws us into the broader fight between Sunni and Shia forces in Iraq."